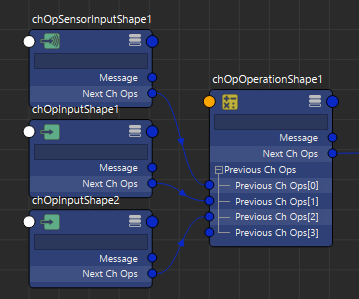 Channel Operators (ChOps) are nodes which can be used to process data in a graph. They allows to manipulate various input values in order to produce some output channel values. The Channel Operators can only be used by being indirectly or directly connected to an output of a Channel Operator Behavior. you can also create new nodes in the Golaem Channel Operators user interface by hitting the Tab key, and typing the name of the Channel Operator to create. Channel Operators can then be connected by clicking on the orange connection disc of a node and holding the mouse button while moving the cursor to the next orange connection disc. Notes Channel Operators have no influence at all on the execution of the graph of channel operators. ChOp Note Text notes in the graph of Channel Operator. Inputs Channel Operators do not have previous Channel Operators, and produce an output value. They are represented with green icons. 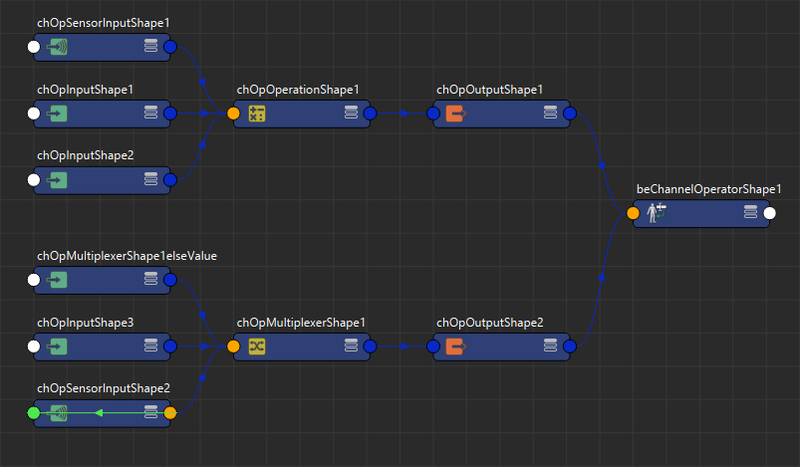 ChOp Input inputs any kind of value into the graph of Channel Operators. ChOp Sensor Input inputs float values that depends on Sensors Locators into the graph of Channel Operators. Operations Channel Operators produce an output value that depends on the previous Channel Operator(s). They are represented with yellow icons. ChOp Operation does basic mathematics operations on values from previous Channel Operator(s). ChOp Converter does type conversions on values from previous Channel Operator(s). 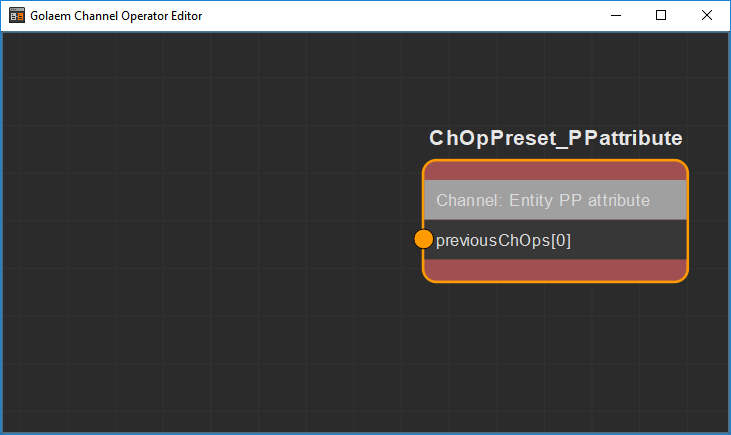 ChOp Multiplexer combines values from previous Channel Operator(s) into a single output value. ChOp Accu Accumulate values from the previous Channel Operator and returns an average or a specific value. Outputs Channel Operator inject the value from their previous Channel Operator into the selected output. They are represented with red icons. ChOp Output outputs the value from the previous Channel Operators into the Golaem simulation. Channel Operators are connected together via their NextChOp output plug and PreviousChOps input plug array. Depending on its type, a Channel Operator may use the value of only one or several Channel Operators connected to the PreviousChOps plug array to compute its own value, and the index of the connection might change how its value is used. Check out the documentation for each Channel Operator for more details. Each Channel Operator will compute and output a value that can be either a float or a vector3. Depending on its type (see Types of Channel Operators), the value may depend on other connected Channel Operators (see the Connection part below).